Mayor Sham Emanuel shows Doctor Willie Wilson how to use taxpayer’s money to buy votes. 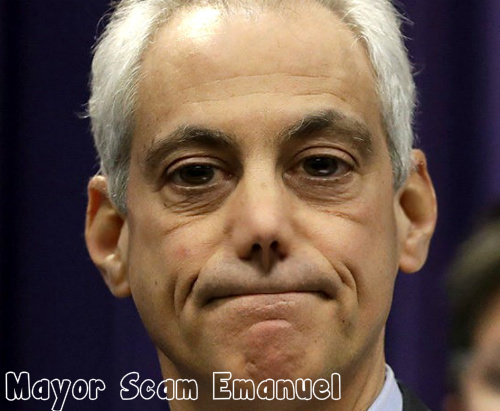 Mayor Scam Emanuel has again found himself using taxpayer money to buy favors for votes. In another version of TIF’s, Rahm used taxpayer’s money from contractors and future homeowners to play Robin Hood. The real scandal is the way the money is distributed. Instead of placing the taxes into the general fund, Rahm can control which of his friends receive money. Alderman are again cut out, making it necessary to cut the number of Alderman number to 25. Rahm “Scam” Emanuel is again not using his own personal money but using other people’s money to obtain votes. Grants like these are not distributed by actual needs, but by the whim of those areas that politicians wish to target certain voters. We wrote prior that Rahm and the Alderman attempting to destroy Willie Wilson’s campaign, forgot Doctor Willie Wilson was using his personal money. Try to get a dime out of Rahm’s personal fortune is impossible. Rahm also has his wife making piles of money on the side. If you think Rahm Emanuel really cares about blacks, you have been duped. Rahm has always been about rewarding the north shore elite that find ways around campaign contribution limits. Those folks receive billions and unlimited contracts with no oversight and regular renewals. If you drive around Chicago, you will see a drastic difference between the Northside, the Westside, and the Southside. It is not by accident; the money will always go to the same places and the same people. Many millennials pretend they care about the poor and the needy, but when they close the curtain to vote, Chicago will always vote with its wallet and selfish interest. Too bad nothing is left in your purse anymore. Next PostNext The Chicago Mayoral Race begins and the “Dead Horse” drops out.